Breakfast was served in the bar area of the hotel and it was surprisingly good. At one of the tables was a fellow pilgrim from Seattle who considered himself an expert on blisters. He had been talking to Greg earlier and Greg mentioned to him that I was having problems with blisters. This guy was absolutely firm that the blisters had to be broken and drained and then bandaged carefully, etc. He also said that it was better to stay off them for a while. This was not an option for me, however and I decided to listen to Heather and perhaps seek medical attention when we got to the next town. 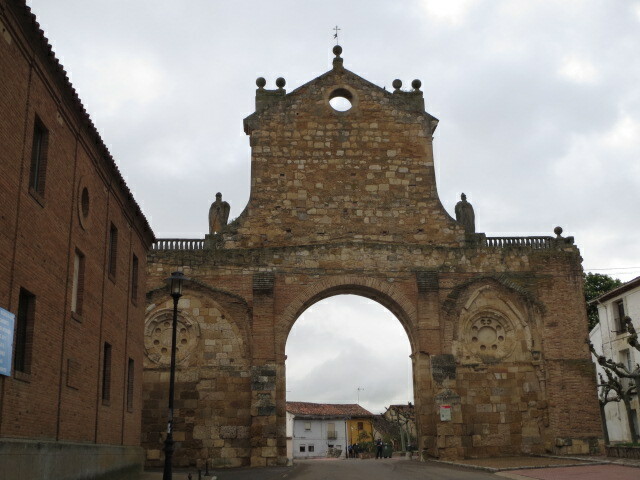 We set out about 9:00 am and easily picked up the Camino at the south-western section of the town. 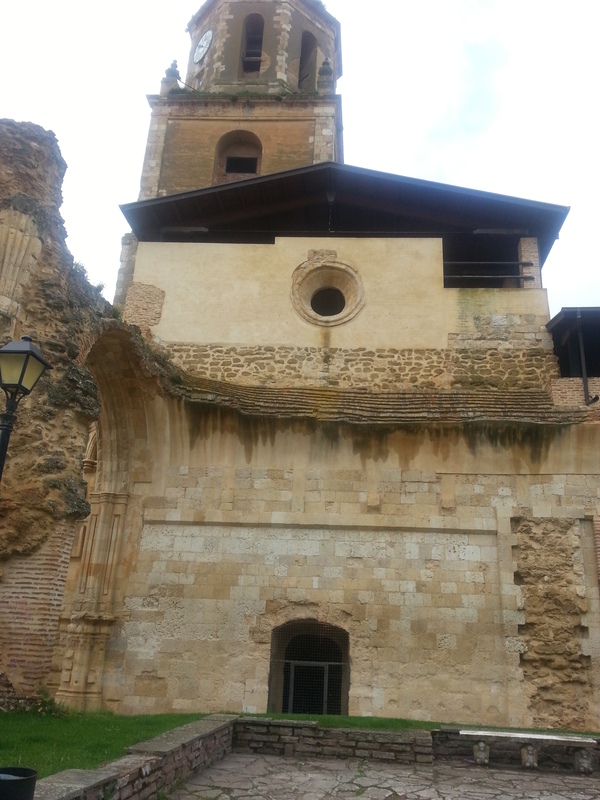 I stopped to take some pictures of the Arco San Benito and the San Tirso church next to it. 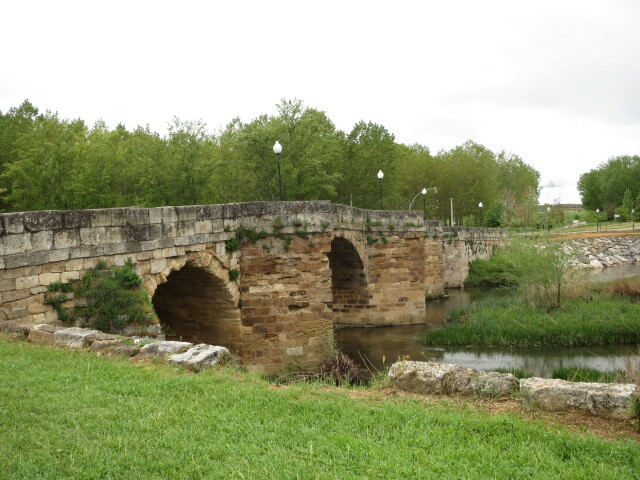 While at the Arco, we ran into the woman from North Carolina and she walked with us for a short time out of town, across the Puente Romana and west along the N-120 until the trail split into the Real Camino Frances and the older Via Romana. Greg and I took the turn to the left towards El Burgo Ranero and once again we were on a boring and merciless Senda. It was threatening rain all day, and we had some brief sprinkles here and there. At a rest stop, we had another chance to see some interesting grafitti. 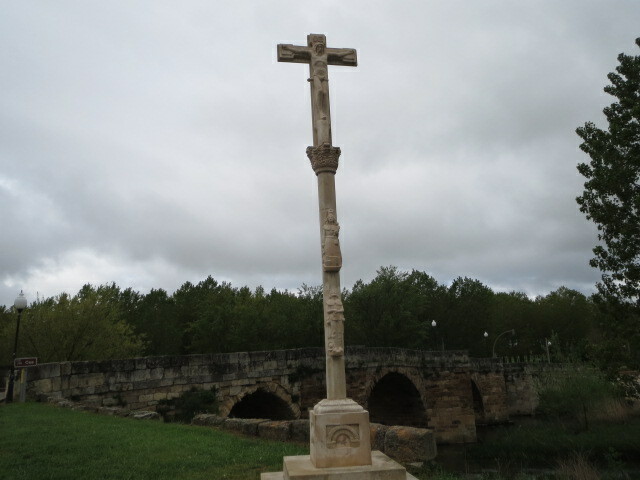 It was a relatively short day for us and we reached El Burgo Ranero mid afternoon. Our hotel was more like a motel on the busy A-231. 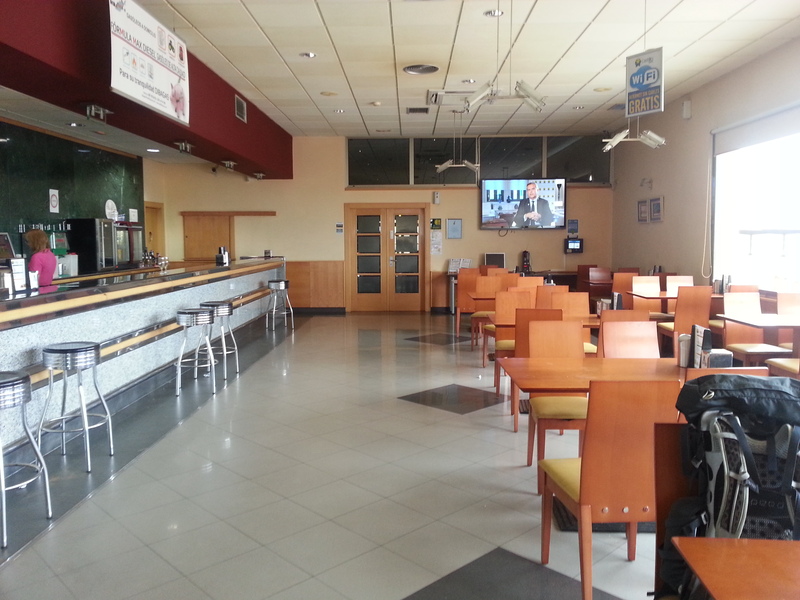 It was attached to a large truck station and appeared to be relatively new with a diner-like bar on the bottom floor and a large dining room towards the rear. The WiFi worked well in the room. Greg took the opportunity to Skype Marianne, and I could see that he was really happy to talk to her face to face. After showers we headed down to the bar area for a drink and to wait until dinner was served in the dining room. Soon, the doors flung open and they appeared to be ready for us. Greg and I were the only table that had more than one person at it. All the other tables were single men. I figured that this really was a truck stop, and all these guys were truckers who ate quickly, drank fast and got out of there. Several of them started dinner way after us and finished long before we did. Earlier, while sitting in the bar, I took the time to familiarize myself with Spanish food terminology and figured how mistaken I was to think that my knowledge of Mexican food would sufficein Spain. Not the case at all. Tonight I had a good steak along with the omnipresent fried potatoes. Desert was ice cream, as usual, a small paper cup. In the morning, Greg’s refusal of coffee was misunderstood as a refusal of breakfast entirely and we couldn’t correct that so we just ate some fruit we had in the room and got an early start.